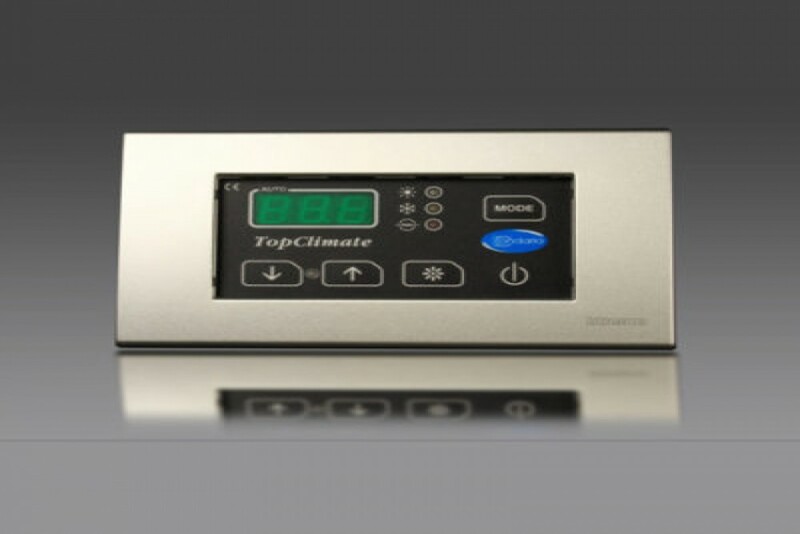 The Top Climate MBS6 represents a resolute evolution of the fan coil control if compared to the devices now used to control the climatic comfort of a cabin. Extreme Compactness: The display of the controlis fitted onto the frames of the most widely used switches, that allow its trimming of the control with decorative plaques to match the other electric devices installed on the boat. It is no longer necessary to hide the regulator into cabinets or behind the curtains! User-friendly design: the instrument is provided with a flexible polycarbonate membrane, anthracite colour, that covers the keyboard below, allowing the operation of the various keys which are not visible or protruding. The display is three digits, green in colour, so not to annoy the user, and its brightness varies automatically with the lighting of the room. The use of the regulator is intuitive andconsists of a few easy and user-friendly operations. Use is further simplified by a clear and intelligible instructionsheet. Advanced technology: the instrument allows the setting of three or ten blower speeds. The user can also choose the AUTO function to automatically control the speed of the blower. When the cabin set point is significantly different than the room temperature, the blower functions at top speed; as the cabin approaches the set temperature, the speed is automatically reduced down to the programmed minimum. This thermostatic control device can control an optional electric heating coil, and of course the standard cooling and heat pump modes. The TopClimate can manage the operation of a three-way valve with by-pass fitted on the air-handler, otherwise room temperature regulation is achieved by means of start-and-stop of the blower to maintain the set temperature as steady as possible. The most unique feature of the new TopClimate regulator is how well it suppresses the humming generated by the blower motor; this in thanks to our recently developed technology. The new controllers can be interfaced with a computer or a survey system, as the ones produced by Naviop, by means of a B-A-S computer interface board. It is possible to select the showing of the temperatures in either degrees °C or degrees °F.